Hop aboard this authentic coal-burning steam train and immerse yourself in an adventure through the tranquil Amish countryside. Explore Dutch heritage and miles of scenic farmland from a seat on a real steam train, from Strasburg, PA to Paradise and back. Tour the locomotive and passenger cars and get a glimpse of 20th century railroading up close. An audio commentary provides interesting facts and history about the railroad and surrounding Lancaster County. You can also get off and enjoy old-fashioned fun at Groff's Grove or Leaman Place Grove along the route. Once back from your steam train journey, ride the pint-sized version, shop in the Thomas™ Toy Store and railroad gift shop or dine at the Trackside Café. Train times vary per day. First ride starts at 11 am and run on the hour. Are there special dining excursions or Events offered? Yes. If you would like to stop for a picnic lunch at Leaman Place or Groff's Grove, let the train conductor know when you board. You may also pack your own food or purchase a boxed lunch aboard the train. If hunger strikes upon your return, stop at Trackside Cafe for freshly prepared snacks and foods. 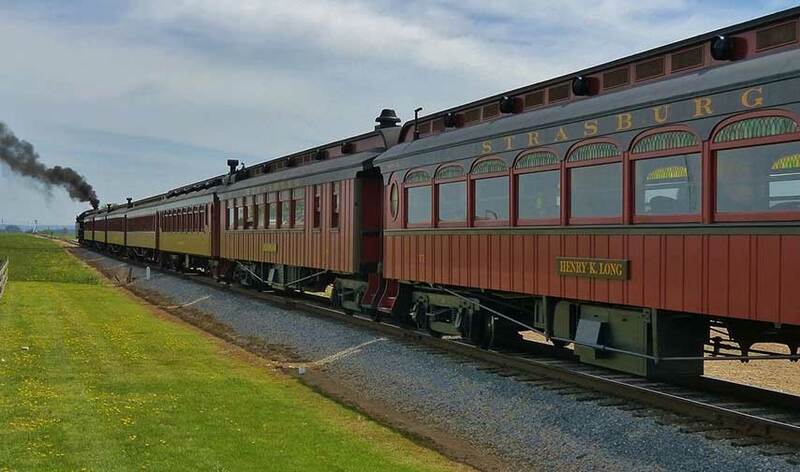 The Strasburg Rail Road also offers themed rides, including The Great Train Robbery and Santa's Paradise Express. What is included in the Day Out With Thomas? Get your tickets for a Day Out With Thomas and ride along America's favorite little blue engine. Your special event ticket includes a 20-minute train ride with Thomas the Tank Engine and friends, as well as lots of exciting activities, like storytelling, videos, and an opportunity to meet Sir Topham Hatt™, the Chairman of the Railway on the Island of Sodor. Don't forget to check out the complete selection of Thomas merchandise in the toy store.